The chief Brexit negotiator, Michel Barnier, for the EU on Friday said that “huge and serious differences” need to be resolved to avoid Britain crashing out of the trading bloc without a bespoke deal. Barnier urged British Prime Minister Theresa May to produce “workable proposals,” emphasising the lack of time before negotiations need to be wrapped up. Hounded by divisions within her own cabinet over which path Brexit should take, May has struggled to provide details of her visions for Brexit to the EU negotiators. She said on June 29 that a white paper would outline the details of her vision. 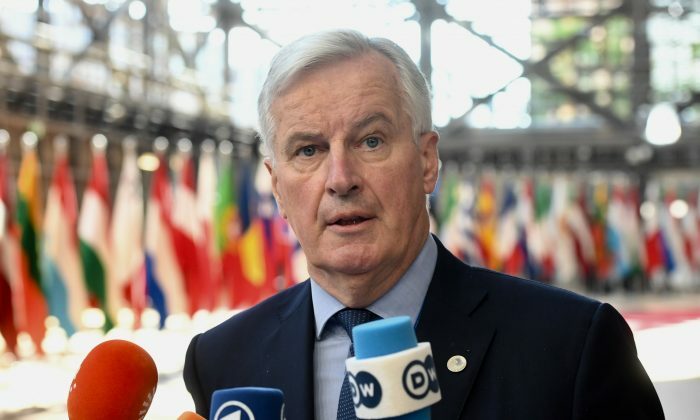 Speaking at the end of an EU leadership summit, during which Brexit was put on the back-burner as leaders thrashed out an immigration stategy, Barnier said that time was short to create a deal between the EU and the UK. “On Brexit we have made progress but huge and serious divergences remain in particular on Ireland and Northern Ireland,” said Barnier, echoing a statement made by the European Council the same day. When Britain leaves the EU, it will create a new land border between the EU and a non-member state—at the border between Ireland and Northern Ireland. How that border will be managed ties together many complicated political threads, such as customs arrangements, trade and the stability of the Good Friday agreement that marked the end of sectarian violence in North Ireland. “The European Council expresses its concern that no substantial progress has yet been achieved on agreeing a backstop solution for Ireland/Northern Ireland,” the statement continued. Backstop solution refers to a contingency plan to manage the border in the event of the UK “crashing out” of the EU without a deal. “The European Council takes note, however, that other important aspects still need to be agreed, including the territorial application of the Withdrawal Agreement, notably as regards Gibraltar.” the statement said. That statement had taken EU leaders only one minute to agree upon, noted Malta’s Prime Minister Joseph Muscat in a wry tweet.